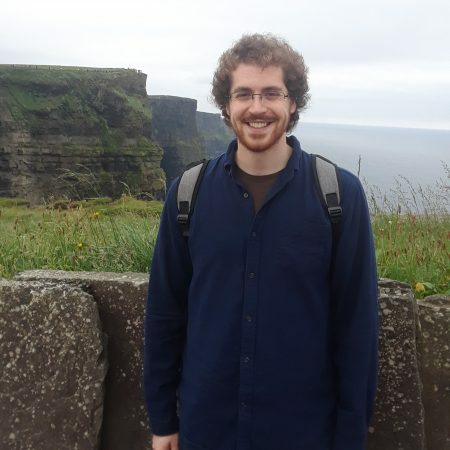 For my research project, I visited Trinity College Dublin in June 2018 where I worked in the Daniel Kelly Lab in the Trinity Biomedical Sciences Institute with supervision from senior post doctoral fellows Dave Browe and Fiona Freeman and PhD student Stefan Scheurer. I was trained during the earliest phase of my research visit on the use of 3D bioprinting software – BioCAD in order to 3D print scaffolds for examining the mechanical behaviour and cell viability of printed structures using a RegenHU bioprinting system. I was also trained on the use of wet lab and biological and chemical laboratory procedures and protocols – many of which I was not able to previously develop at my home institution. During my visit to Trinity College Dublin, I worked on two particular projects based on 3D bioprinting from both the material development perspective focusing on the incorporation of bone and articular cartilage into printing materials and on the scaffold design of the meniscus within the knee. For the first part of my research, I located a supplier of porcine knee joints in order to perform tissue extraction and harvesting. I harvested the meniscus and articular cartilage from the knee joint using a scalpel and biopsy punch and stored the tissue for further processing. I then dissected and separated the outer and inner regions of the meniscus as the chemical composition and collagen type concentrations differ between the regions. I then focused on performing a standardized protocol for solubilizing the inner meniscus, outer meniscus, and articular cartilage to create a soluble material that could be incorporated into a printing material, polycaprolactone, to be printed into constructs using a 3D bioprinter. 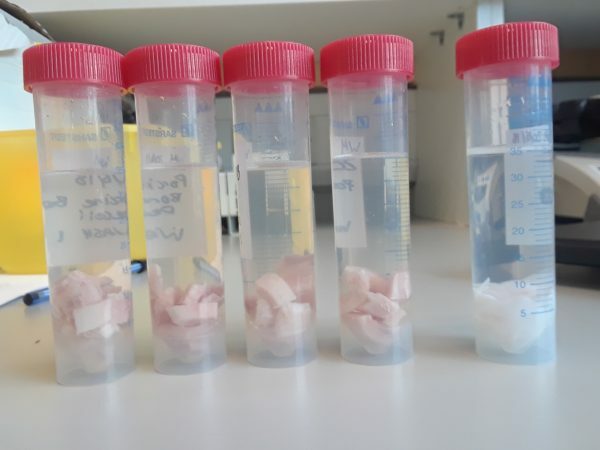 To convert the harvested tissue into a solubilized form, I carried out an agitation-based NaOH pretreatment, followed by a centrifugation step and separated the pellet and supernatant. After washing the material, I performed a pepsin digestion and multiple salt precipitation, wash, and dialysis steps over the course of 2 weeks to isolate the solubilized meniscus and articular cartilage. Concurrently, I researched into the mechanical properties (compressive, tensile, and shear strength) of the meniscus at various regions and aided in created a map of the tissue based on its differing strengths. 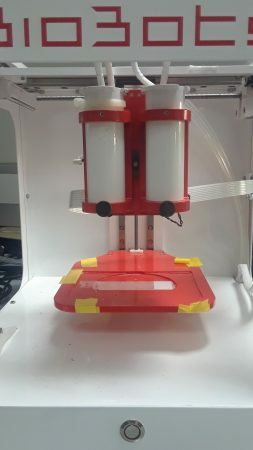 After designing a 3D printed polycaprolactone scaffold with differing mechanical strengths, scaffolds were printed using the RegenHU 3D bioprinter and tested under uniaxial compressive and tensile loading conditions using a hydraulic load frame to generate stress-strain curves. Cyclic testing was also performed to quantify the viscoelastic behaviour, presence of creep, and stress relaxation of the structures. This was done with the constructs being dry and also wet in PBS solution. To create a structure with improved relaxation properties to mimic actual meniscus tissue, a “bio-ink” was created using alginate, GELMA, and cells and was added to the printed constructs. Additionally, before addition of the bioink, the solubilized meniscus and articular cartilage was prepared and casted on the printed structures and imaged. A Live-Dead assay was performed at this time to quantify cell growth on the scaffolds and gel formed prior to my visit, and the analysis was performed using a confocal microscope. With the results from the mechanical testing, the architecture of the 3D printed meniscus construct was able to be optimized based on printed filament width, offset, and presence of gel within the printed structure. For the second part of my research, I focused on created 3D printed polycaprolactone scaffolds using decellularized bone (femur) and decellularized articular cartilage. As there has been success with using solubilized bone tissue to influence stem cells to differentiate into bone cells, the method of decellularization of bone tissue and incorporation of the material into 3D printed material could be compared. Furthermore, the decellularized articular cartilage could be compared to the solubilized articular cartilage to see which method and material improves bone and cartilage development from stem cells to better produce a printed joint for use in vivo. After harvesting porcine bone tissue and performing a decellularization protocol on both the extracted bone tissue and the articular cartilage, I developed a protocol for incorporating the decellularized material into polycaprolactone to be 3D printed. 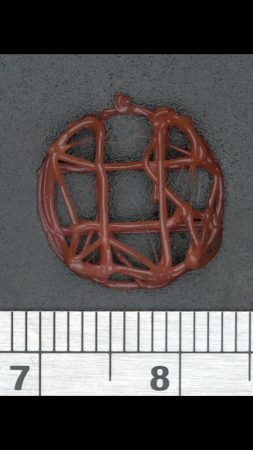 With polycaprolactone prepared with decellularized articular cartilage and decellularized bone tissue, I created a scaffold design using Computer-Aided-Design (CAD) software which featured overlapping filaments in a cylinder arrangement to control the porosity of the structure. I then prepared how the structure would be interpreted by the 3D printing software to ensure the print quality of the structure would be adequate for further analysis by varying printing parameters such as temperature, pressure, nozzle diameter, filament width, extrusion speed, and layer parameters. After performing calibration, I used a Biobots 3D printer to print scaffolds with decellularized bone and articular cartilage incorporated in the printed filament. After printing, I performed two different staining analyses to mark the presence of calcium ions (from bone tissue) and glycosaminoglycans on the printed scaffolds to determine the feasibility of using decellularized tissue as a scaffold material. After post-staining imaging, I was able to confirm that the presence of decellularized bone and articular cartilage have been able to influence the scaffolds composition, and thus, interaction between the scaffold and seeded stem cells which will affect the differentiation of the cells during development. From this research endeavour, I have been able to make a number of contacts at Trinity College Dublin’s Trinity Institute for Biomedical Sciences, and Department of Mechanical and Manufacturing Engineering including: Professor Dr. Daniel Kelly, Post Doctoral Fellows Dr. Dave Browe, Dr. Fiona Freeman, Dr. Grainne Cunniffe, Dr. Bin Wang, and PhD students Stefan Scheurer, Ian Whelan, Ross Burdis, Jessica Nulty, Pedro Diaz Payno, and Rossana Schipani, among others. Moving forward, to continue the collaboration between the University of Prince Edward Island, and Trinity College Dublin, the research group I work with at the University of Prince Edward Island, the Atlantic Biofabrication Laboratory, will be looking to send student interns to Trinity College Dublin on various research visits in the future to continue the work completed on my research visit and to continue to strengthen the connection and collaboration between the institutions.